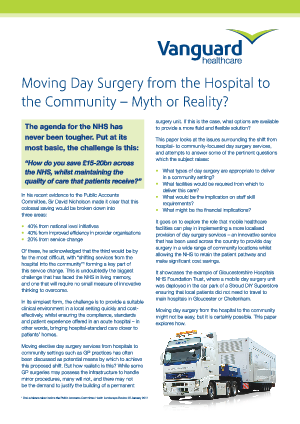 Resource Centre > Research Gateway > Vanguard Healthcare Solutions Ltd > Moving Day Surgery from the Hospital to the Community - Myth or Reality? One element of service change that has often been discussed is the possibility of re-locating some elective day surgery from the acute hospital into a community setting. In its simplest form, the challenge is to provide a suitable clinical environment in a local setting, quickly, safely and cost-effectively. But how realistic is this? This paper looks at the issues surrounding the shift from hospital- to community-focused day surgery services and what options NHS Trusts have in meeting this challenge.